When it's over, it's over. Horse gets over it, so can I. So do I. Being particular when leading. Asked Rusty to wait without eating when I got to turn out area. Being creative. Bridled Rusty in pen before leading him to turn out. Being particular. Asking for horses to turn to me in pen when I went in. Needs work: getting attention without touching. Focus all the time. Be present. That's the hardest part. AD raised issue: leader horses do not walk around other horses -- should we never walk around a horse? Harry: No. If you ask, horse should move or if horse is coming down fence where you're standing, horse should walk around your space. Ego: it's safer not to ask horse so no chance he'll fail us. Can you see where it started? The stuff that today you feel "I've had enough"? RR: I'm about tired of it. 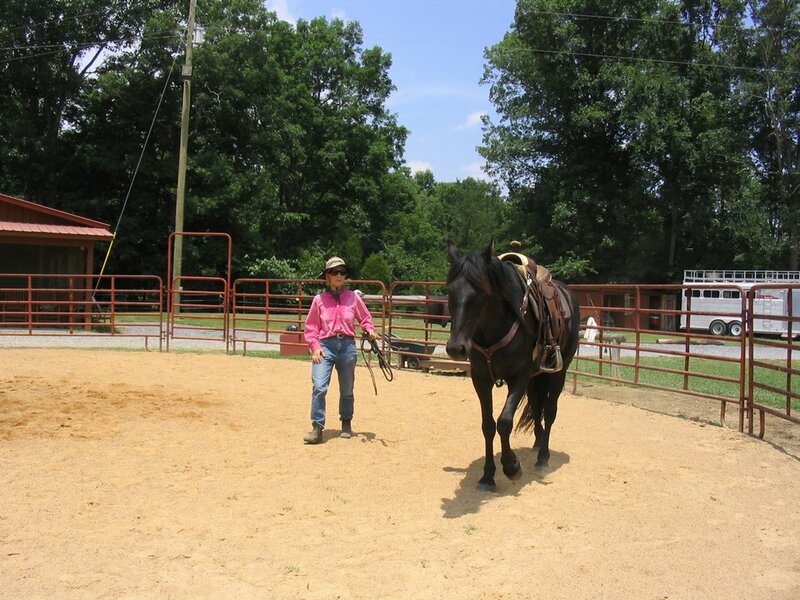 Timing of whacking ground = when horse is commited to leaving her. When you ask for something, get a change. Backing up, stopping, moving head out of my space. Get a change of thought, not just a body change. Effectiveness of what you're getting done more than how you go about it. Stepping toward hindquarters, NOT to drive it away but to bring thought around with you and meanwhile his body will shape up. 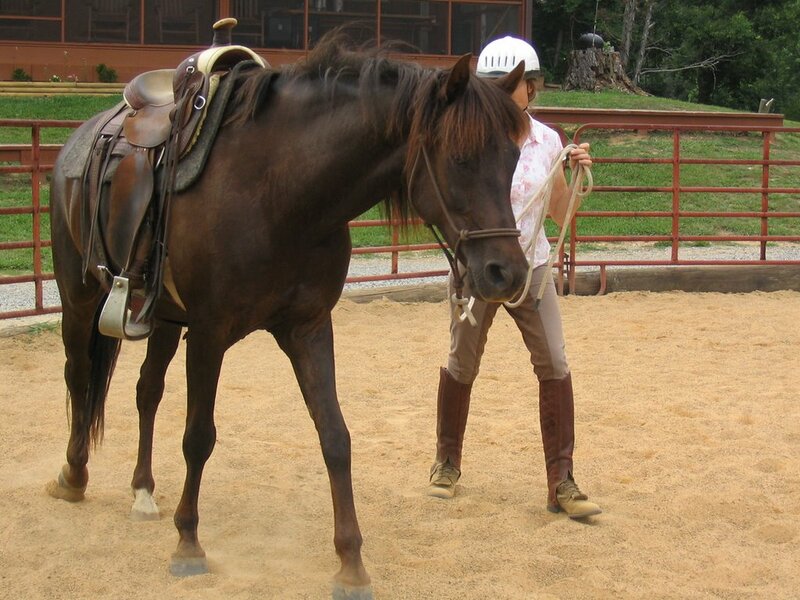 To a sensitive horse, even a little ask will be too much pressure. So they're always trying to get ahead of the pressure. Instead help him slow down, stop, wait to find out what you are going to ask. Being the Knight in Shining Armor doesn't help horse be confident. Like standing out at the end of the lead rope, see if horse can make it there. Don't leave him too long without a pet but don't stay too long petting him. "Every time you ask, you have to stick with it until it comes through." "You get what you settle for." From the movie, Thelma and Louise. Where is horse's attention? In circle, left/inside ear is with her. Eyes are more indicative of where their primary thoughts are than their ears. Longer reins let Bo relax neck. Circle: keep walk at same speed and look for head to drop. Sets it up so horse has to use hind end better in order to keep moving through the circle. Break up pacing: lateral work, bending to release topline, cavalettis. What's wrong with just going out for a fun ride and not being so particular about all this stuff? Every time you settle for less, your horse will give you less. Like pick up a rein and not getting a change in thought. Can really firm up to block a thought, but not to make a horse do something. Can start with lots of transitions and direction changes, etc. RR's habit is to get those at the end. "If my horse is tight, not listening, I'm going to be doing frequent, frequent, frequent transitions." Work on bump with leg more effectively then leave her alone. Nagging is asking every step before she quits. Instead, let her quit and ask her forward again. Set up for right lead by getting her balanced over her shoulders at trot before asking for canter. Send and allow her to find me, wait for her to come without my drawing her! 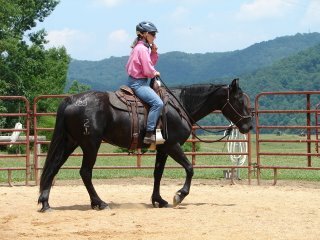 Then send more and go with her, walk trot then lots of trot canter transitions. Sending her off from in front of her. Using my energy -- speed and energy of my body regulating her gait. When changing direction on leadline, me keep facing her and let her/help her back and yield to my space in order to negotiate the turn. Don't worry too much right now about her crankiness when I ask for more life. One time when she had some bouncey head shaking reaction to my asking for up transition, Harry told me to drive her forward when she does that, don't let that work out, which I did. Gets his life up easily! Harry helped with getting change of directions on lead line. 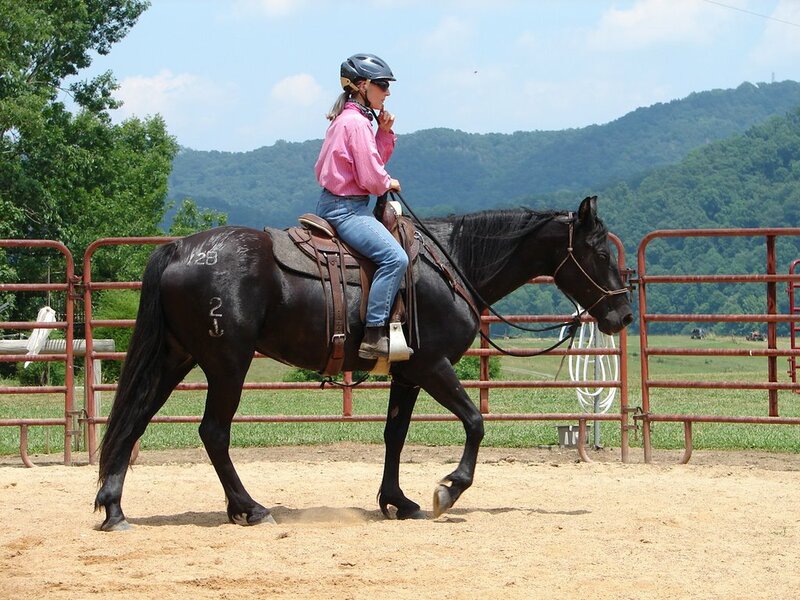 Under saddle: backing: don't pull or shorten reins so much that he tucks his head. It was a gift to watch AD ride Rusty!